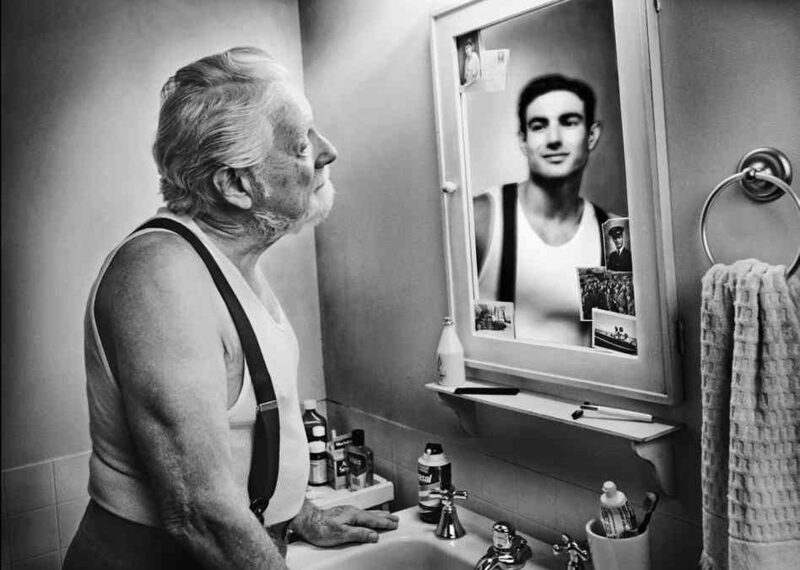 Photograph by Tom Hussey, one from his “Reflections” series, in which older people look in the mirror at their younger selves. His photographs make me wonder, as I often do, how I would better prepare for these days of ecological crisis if I could go back in time. I’d take shop in high school, and get myself started on making things and fixing things early. I’d never stop drawing, painting, making art. I’d specialize in computer hacking, rather than perhaps more respectable, but less useful, areas of computer science. I’d go to law school. Maybe. Or maybe I’d get a degree in environmental science. Or, no, wait, I’d just spend a whole lot more time outside and surround myself with naturalists of all kinds. I’d definitely hang out with farmers (real farmers, not industrial ag farmers). I’d never buy a gym membership. I’d learn how to chop wood a lot sooner than I did, and stay fit walking, hiking, and chopping. I’d learn how to fish, along with the proper ceremony to give thanks and gratitude for the gifts of the river from my European ancestors and from descendants of ancient ones in my new homeland. I’d learn all the flowers and the trees and the birds and the tracks in the snow and the mud, instead of worrying about how I looked, or what I was wearing, or spiffing up my resume. (I didn’t do a whole lot of those latter things, but enough that it now feels like I wasted a lot of time). Perhaps most useful of all, I’d make friends with someone from special ops. I’d never actually want to be special ops, but I’d want to learn many of those skills: how to be stealthy and brave and how to strategize and organize. It’s never too early (or late) to prepare for the revolution.